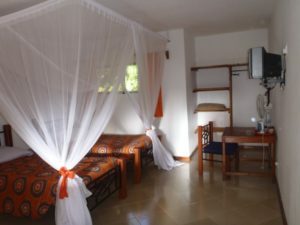 We have 28 clean and comfortable rooms, all with bathrooms en-suite, satellite tv, safes, fans, mosquito nets, soap, shower gel, shampoo, kettles with coffee and tea. The rooms are a mixture of singles, doubles, twins, triples and 1 quadruple. 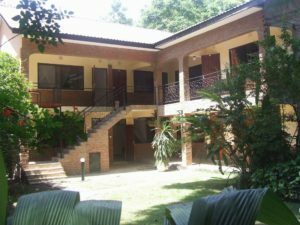 All the rooms are in a garden setting and have outdoor seating areas.Our accommodation is rustic, with an emphasis on clean, comfortable and affordable lodging, and a special ambiance of its own. Cleanliness is of prime concern and we pride ourselves in this respect. Water is a concern countrywide and while we do have plenty of storage, the municipal water supply is extremely erratic and can sometimes cause unforeseen shortages. We try hard to cope with the system, but are caught out occasionally. Due to this countrywide water shortage electricity can also be erratic due to the poor hydro power stoppages. We offer daily laundry services for a minimal fee. Due to water shortages, washing of clothing in the rooms is not possible. We welcome disabled travellers and have a room which is completely accessible, please kindly make advanced arrangements with management for this room.